Lee Ufan, the Korean minimalist painter, sculptor and academic is praised for his extensive contributions to the development of Mono-ha (“School of Things”) and Postwar art in Japan. Ufan trained as a philosopher upon his arrival in Yokohama in the late ‘50s. Concerned with material meaning, he’s known for his works that reflect upon scale. He has taken over an entire museum on the Japanese island of Naoshima and a large part of the surrounding landscape with both sculpture and painting. 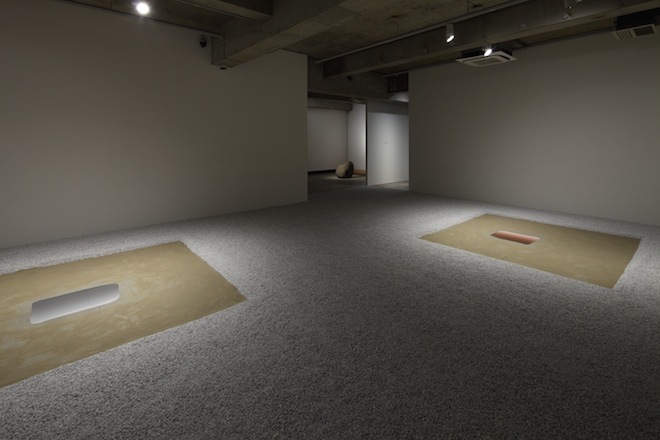 Ufan’s current solo show at Tokyo’s Kaikai Kiki Gallery compounds his Mono-ha roots by creating two installations that feature stone, sand and canvas. Relatum – Excavation (2014) turns physical material, untouched by the artist, into “archeological elements” that describe an overwhelming passage of time. Murals are excavated, painted on the ground amidst a sea of sand and pebbles. He treats the basement gallery as an archeological dig, mapping both the shifting gallery space and the murals themselves. How this piece detangles what Ufan would call “threads of art history” is a question whose delicate shift is as incremental as the work itself, but one that’s worth exploring. If this excavation of painting defines anything then it’s the relationship had between people and place; an effect triggered by the subterranean setting of the gallery itself. Ufan is one of few artists of his generation that still elicits debate, one being the question of Asia’s persistent culture of Westernisation. On August 9, don’t miss the opportunity to share the same tatami with Lee Ufan and to hear him speak about his work, post-war Japanese art, making his career abroad, and many other topics.